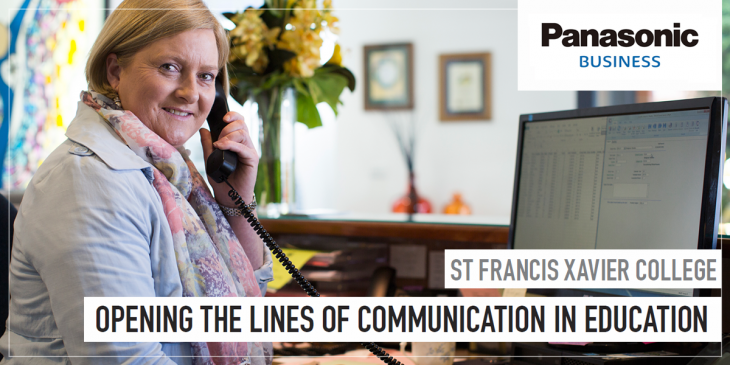 Canberra’s St Francis Xavier College has increased staff mobility and cut a third of its phone bills by recently implementing a new state-of-the-art Panasonic IP business telephone system for the school’s 1,170 students and 150 staff. The College was frequently suffering from telephone outages due to major lightning storms, old carrier faults and an aging traditional system. Consequently, the old copper phone wires were becoming damaged and meant staff were often not receiving incoming and outgoing calls. It urgently required a new modern fibre IP telephone solution to replace the 10-year-old legacy system. After assessing various solutions, the College decided to go with an on-premise Panasonic PBX solution, recommended by Panasonic Unified Communications channel partner, Sedcom. The 10 hectare campus, which is based in Florey, ACT, has now implemented the unified Panasonic telephone system across its six campus buildings. This includes 70 KX-NT551X-B 1-Line IP desk phones and 20 KX-NT553X-B 3-Line IP desk phones, underpinned by the KX-NS1000 business communications server and activation keys for third party SIP phones, with multiple units throughout different buildings used as a combined PBX system. The College opted for an on-premises solution vs. a cloud-based hosted one, giving them the flexibility to maintain and update the system easily with the support of Sedcom and its Business Phone Centre. Using a convenient web-based browser interface, the College can now manage everything internally at the click of a button – instantly identifying any faults (such as a phone line coming out of the socket) and solving them quickly, which saves time and boosts productivity. The new solution has had an immediate impact on the College’s communications budget, with 30% annual cost savings on its phone bill. Plus, with unlimited calls as part of the monthly plan, there are no concerns about high call charges and budgets can be planned in advance. Mobility has been boosted, as the IP telephones enable teachers to call one another from the comfort of the staff room and hold conference calls between different teams. This has increased collaboration and cross-team learning. They also receive an email to notify them when they have a new voice message, alongside an attachment of the recording, so they can monitor calls away from the classroom. Plus, management also have their own phones to keep in touch with important stakeholders and parents. Introducing Panasonic solutions has even future-proofed the College’s telephone system by embracing the BYOD trend. With staff increasingly using their personal smartphones to make work-related calls, the new system allows a “softphone” feature so every teacher can now run an app on their own smartphone that makes their mobile an extension of the PBX. This increases efficiency and minimises disruption when staff relocate to a different classroom or building, for example, as they are not locked to a specific handset or phone line.